For most women out there, the kitchen is either your best friend or worst enemy. Having a cluttered, untidy kitchen can make cooking for friends or family a lot more stressful than it ever needs to be! Whenever I am designing a kitchen for a client, storage is one of the main priorities and with good reason. When you are working there every day you need to be able to find things easily without the need to get on your tummy and search to the back of that lower cabinet. 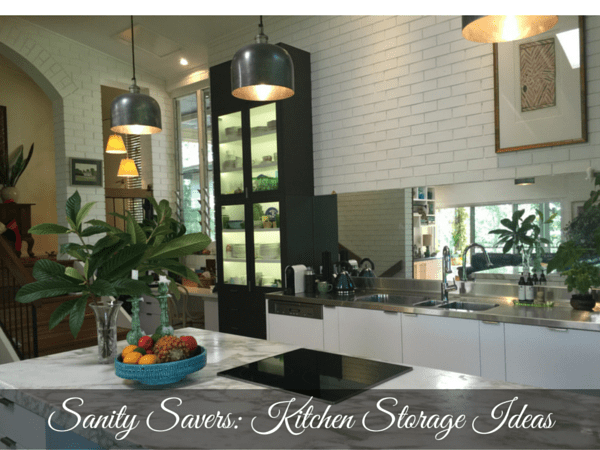 I also understand that not all of us can simply renovate their kitchen overnight, but there are plenty of great ideas out there that will save your sanity when it comes to kitchen storage! So in the spirit of home, family and cooking here are my favourites. Baskets are great for keeping lots of little things all together in the one spot. Not only will this keep your benches nice and tidy, but you will know exactly where your favourite wooden spoon is when you’re in the middle of cooking dinner! Using baskets in your pantry for spices or sauces will also give you much more storage space. I have a basket next to the toaster with fresh bread and baked items. The pantries below are so well set up and look great at the same time. I like to be able to see everything and this system makes it easy (if you have the space of course). You can always do it on a smaller scale to suit your own pantry. Keeping spoons and utensils in jars like the image below can free up a complete drawer in your kitchen. The racks below are a great way of keeping your pots and lids nicely organised! Using the inside of a door creates an extra storage space you may not have ever thought of! You’ll never be searching for that one lid ever again. For those up for a little renovation challenge, utilising the space above your counters with floating cabinets will double the amount of storage in your kitchen. Using glass doors like the image below brings fresh styling to the kitchen with the pop of blue colour and visible dinnerware. If you’ve collected a few dinner sets over the years, I’m sure you will find it hard to keep them organised in your kitchen! Disorganised cupboards mean a wasted space, so transform your deep kitchen drawers into dish drawers! This will keep dinner sets together, and use only as much space as they need! I like to be organised because quite frankly my life runs smoother that way. When I work with clients renovating their kitchen their thoughts of what they want are all over the place. They have booklets, pictures, notes and contacts everywhere. So I thought that creating a handy little Kitchen Renovation Kit would be super helpful to keep you on track and give you a checklist of everything that you need to think about. This hidden countertop below is fantastic! When you have a lot going on in the kitchen you can never have enough bench space. This is really an idea for those renovating their kitchens and would be a fantastic addition to any new kitchen. When my children were growing up they were always painting, drawing and making things in the kitchen so you could always use it as a special bench for their projects and leave your work space clear for you to work on. I must say, my spice drawer is quite well organised (because I love it that way) but you may have the struggle that your spice jars are strewn throughout your pantry and you can never find the one you want when you need it. This spice drawer below is the ultimate kitchen storage idea and can easily be integrated into your kitchen. By clearing out a drawer for this handy idea, a simple storage insert can slip into the drawer to store all your spices! These inserts can be found at any good storage store. Want to check out my Kitchen Renovation Kit. I have it right here for you!